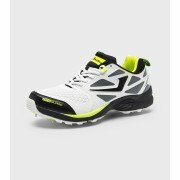 Jazba are the newest addition to the World of Cricket Shoes. A company who formerly manufactured other big global brand cricket shoes for some of the leading cricket companies has now created their own brand. Bringing the same quality and comfort of the big brands but at a fraction of the price for very similar cricket spikes. Jazba cricket shoes and boots are worn across the IPL and will in 2019 be seen on the feet of Professional Cricketers across Australia and the UK.